Freekeh (pronounced freak-uh) is a healthy whole grain food and is young green wheat that goes through a process of roasting, is then cracked or left whole. Really love the smokey flavor and nutty texture of freekeh and like other grains, perfect in salads. 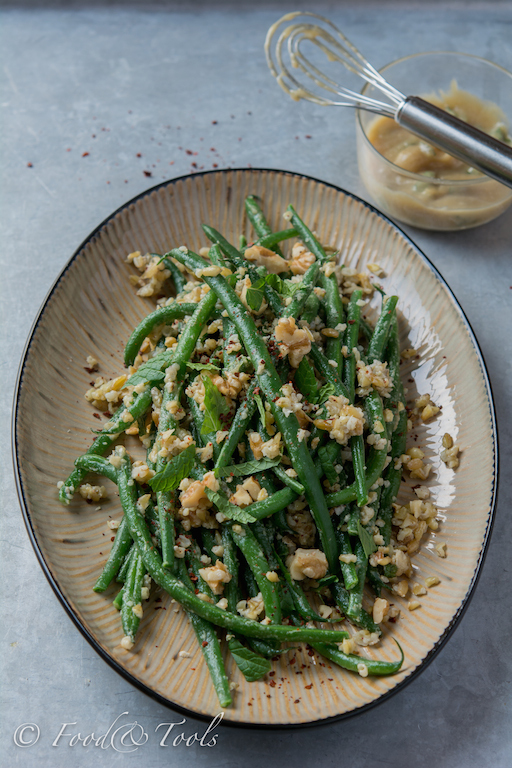 Freekeh is high in fiber, protein and iron and has become another favorite in our kitchen and we love this salad of green beans and freekeh with tahini. I wasn’t familiar with freekeh until I came across this salad in Yotam Ottolenghi’s cookbook Plenty More… already a fan of his Aubergine Cheesecake. It’s an easy salad to pull together and I’ve only made minor changes. Use fine green beans and when preparing, snip off the tops and leave the wispy tails… they look more presentable that way. Making the tahini sauce is a cinch, used fresh mint in place of dried and as I have roasted garlic in the freezer, used this in place of fresh garlic. Used roasted chili flakes brought back from Turkey… not sure they are Aleppo chili though. Had no chervil, so used extra fresh mint instead. Serve with a nice piece of grilled or barbecued fish or chicken. As an alternative you could try freekeh in place of quinoa with this recipe, Quinoa Salad with Grilled Peaches and Chicken or couscous with this recipe, Couscous with Fresh Mint and Pomegranate. Salads always taste better in summer. Recipe adapted from Yotam Ottolenghi’s Cookbook, Plenty More. For the sauce, place all the ingredients into a small bowl, whisk until combined. Cover and set aside. Rinse the freekeh under running water, place into a saucepan and cover with 3 cups of cold water. Add 1/2 teaspoon salt. Bring the water to a boil, reduce the heat to a simmer and cook the freekeh for about 12 to 15 minutes. It should still retain some bite after cooking. Drain and refresh under cold water, once thoroughly drained place into a mixing bowl. To cook the beans, bring a large saucepan of salted water to a boil. Carefully add the beans and cook for about 3 to 4 minutes. Once cooked drain immediately and refresh under cold water. Drain well and pat dry with kitchen paper to remove any excess water. Add the beans to the bowl with freekeh. Pour the tahini sauce over the freekeh and beans and gently mix to coat the ingredients. Gently mix in the chervil ( or mint) and walnuts, if using. Transfer to a serving plate and sprinkle with chill flakes and serve. What a lovely recipe with all your little substitutions. I’ll have to pick up a sack of freekeh and put this one together, it’s one to write home about! Love how you left the tails on the green beans…I always do the same! Hiya Moya You know how to pick them. This sounds fab. Thats a good idea Glenda… do you soak it first? Delicious! 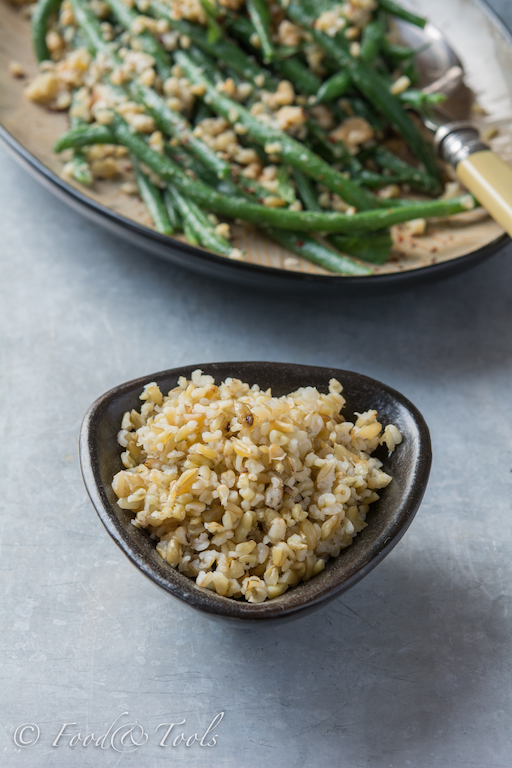 I have that book but hadn’t even noticed this recipe, I’ll definitely have to try it – I’m on a major freekeh kick at the moment – can’t get enough of it!